You are here: Home / Wedding Products / Jewelry / Bridal and Engagement Rings / Wedding and Engagement Ring Symbolism. Choosing the Perfect Rings. If you are one of those blessed couples to become engaged or marry in the near future, congratulations! Likely, the rings are top of mind. A trip to the nearest mall or local jeweler is an option, but you may be missing out on the rings that truly symbolize the love and respect you feel for each other. 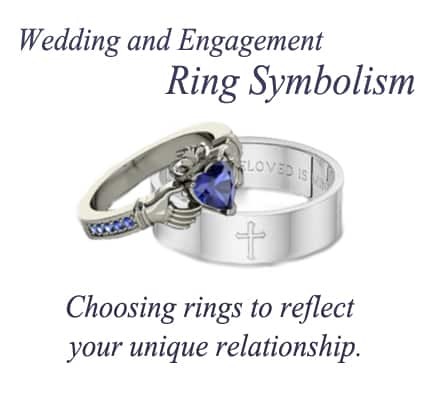 Any ring itself, of course, is symbolic of this love, but other symbols often accompany them. Below is a rundown of what, exactly, different features & elements on your ring can symbolize. Take advantage of the vast online selection to mix and match symbolisms–including engravings, infinity knots, lover’s knots, Claddagh, trinity crosses, and symbolic gemstones. With a bit of Internet browsing, you will be able to choose rings that truly reflect your unique and meaningful relationship. A name, message, or wedding date engraved inside each wedding band is likely the most popular form of symbolism. Did you know you can buy styles engraved on the outside as well? These knots–the former an endless design, the latter the merging of two knots–both represent ones’ undying commitment to her/his partner. Simply-designed promise rings often feature these knots. The Claddagh symbolizes the coming together of friendship, love, and loyalty; two hands encompass a central heart topped by a crown. This symbol is of Irish origin, but is not accepted to have meaning to those of any heritage or faith. A majority of weddings are religious ceremonies that reflect the couple’s dedication to their faith. Wearing wedding rings incorporating the cross design is an extension of that religious commitment. There are many types of crosses–including French, Constantine, Palmetto, Tuscan, All Saints, Monaco, Parisian, and others–you may choose to have represented on your wedding bands. The trinity knot–or triquetra–is another symbol of religious origin. To the spiritual, this symbol may represent the Christian Father, Son, and Holy Spirit. The trinity knot is also a common element in Irish / Celtic architecture and artwork. Those of Celtic background may choose to include the symbol in their rings’ designs as a sign of their heritage. Colored stones are another way to express meaning through your wedding or engagement ring. The most popular choices are rubies (red) and sapphires (blue). The ruby ring and color red are long associated with love and romance, making it an obvious choice for a colored engagement ring, especially if one is to be married near Christmas or Valentine’s Day, giving it double meaning. As an alternative to natural rubies, some choose other red stones such as lab-created rubies, garnets, or other gemstone. Blue sapphires are the stone of choice for Britain’s royalty, most recently demonstrated in the handing down of the vintage oval sapphire handed down to Prince William and Catherine (Kate MIddleton) Duchess of Cambridge for their engagement. Additionally, the sapphire is attributed to many different qualities, including purity of the soul, faithfulness, truth, purity, wisdom, constancy, sincerity, and divine favor.